This post is sponsored by All Clad and all opinions are my own. 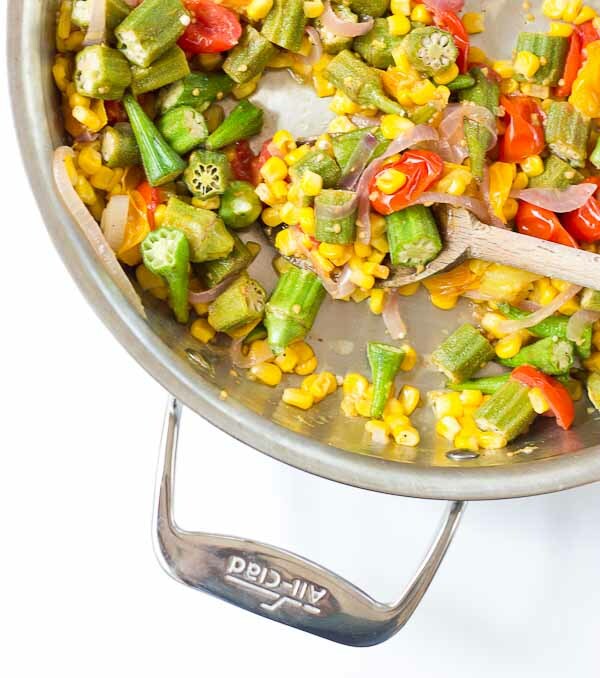 Okra Succotash, a simple sauté of fresh okra, corn, tomatoes, and onions, is a yummmmm side dish for your next cookout… just in time for Memorial Day! I love this side because it’s fresh and filled with seasonal veggies that will make you feel good on a hot sunny day. 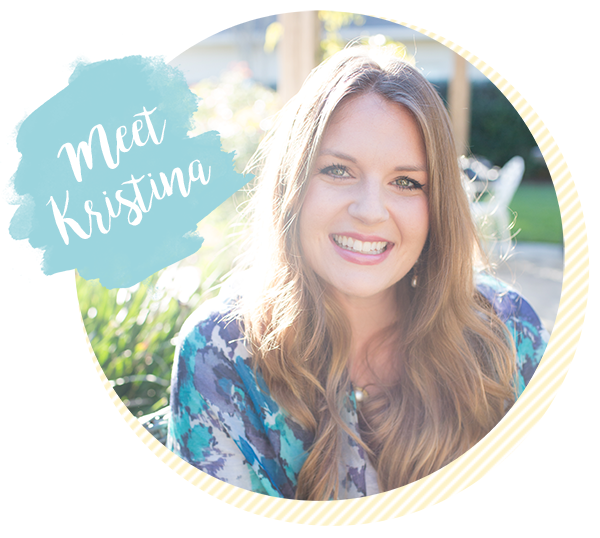 If you’d like to head straight to the giveaway–> CLICK OVER TO MY INSTAGRAM PAGE! I’m an okra girl through and through. Living in the south, you’re destined to grow up eating your okra fried. 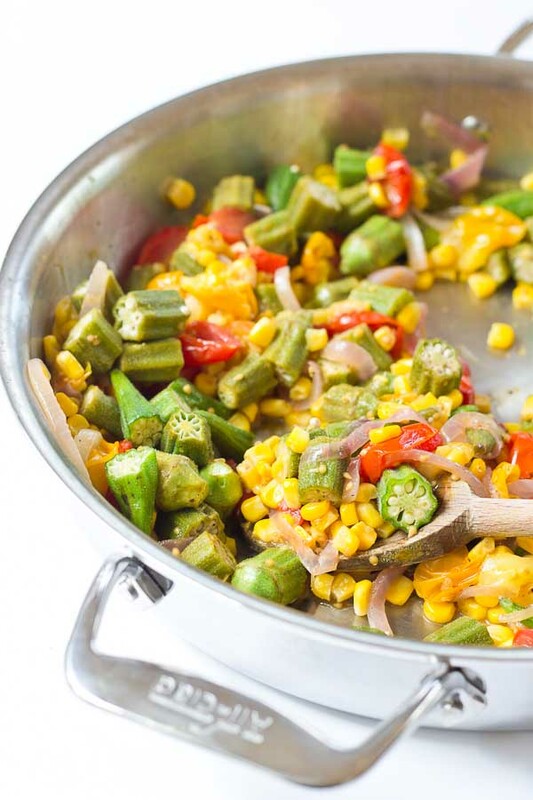 And while I still do love a good fried okra with BBQ or oven fried okra, I now appreciate the fresh taste of okra without all the breading and oil. In fact, I just planted my first okra seedlings in the garden a few weeks ago…can’t wait to harvest the bounty this summer. 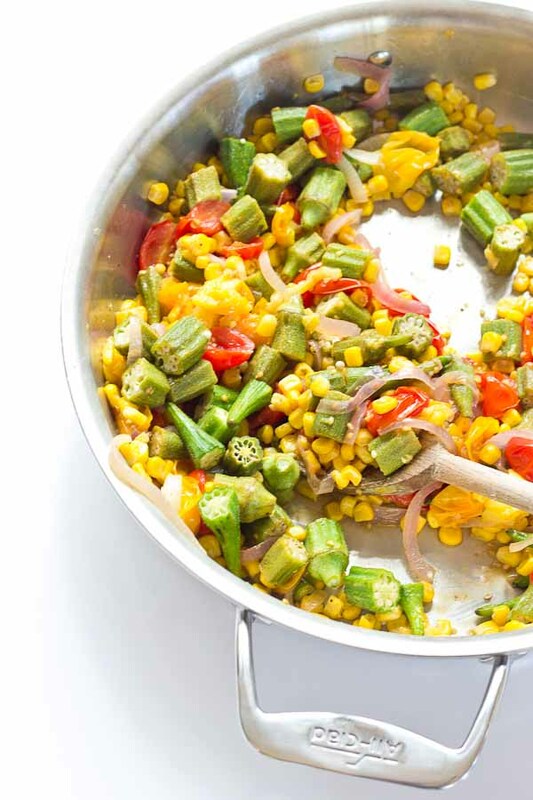 Omg, y’all if you haven’t tried okra yet– you must do it soon. Okra should be easy to find in the grocery store and Farmer’s Markets now, at least I’ve been seeing it pop up in our Florida stores. 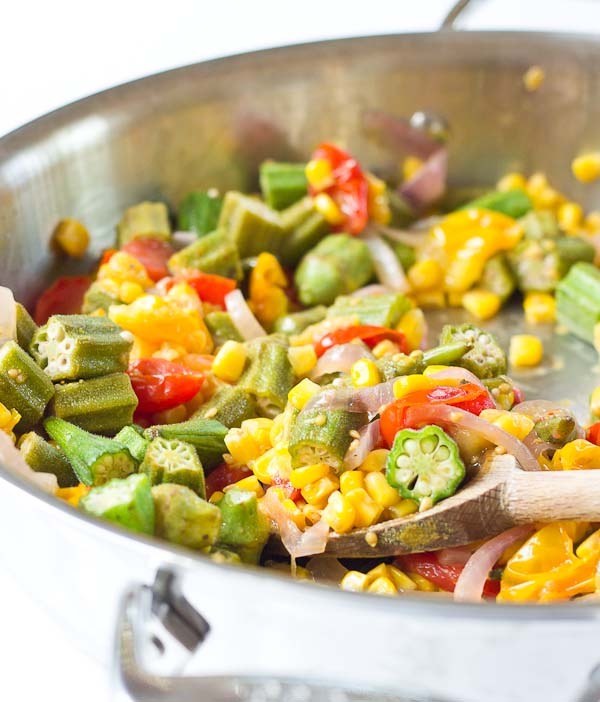 Okra is a low calorie veggie and a great source of vitamin A, C, and magnesium which is a mineral that is often deficient in our diets. 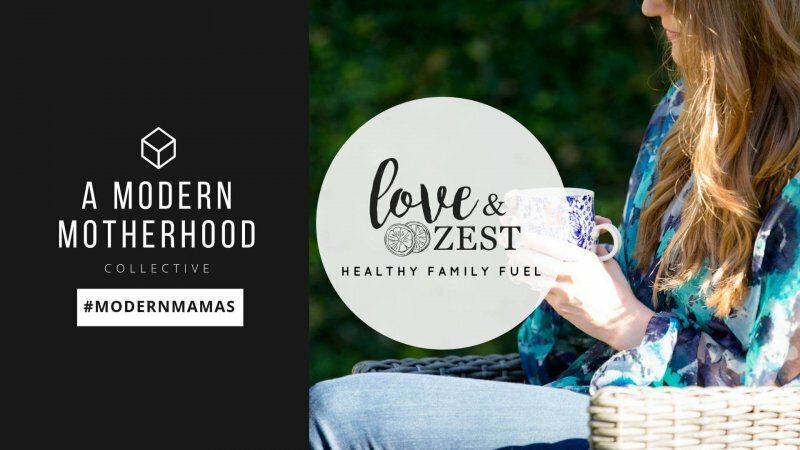 When All Clad reached out to partner on a post for Memorial Day using their new 5d Stainless Steel All-In-One Pan, I was super conflicted with what I was going to prepare because there are so many yummy options. I’m telling you guys, hands down this is one of the best pans in my kitchen. For real for real. 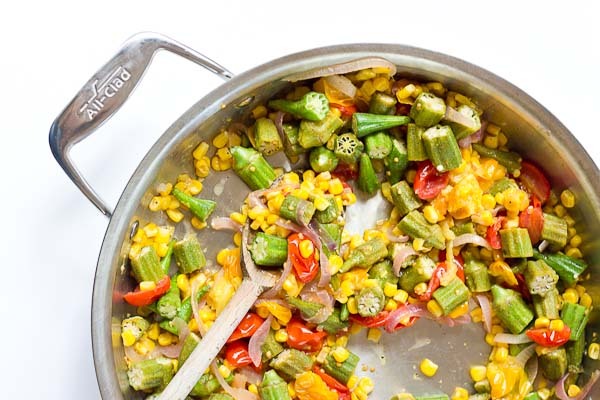 Eric can attest to this as we are both cooking everything in it from perfectly seasoned and browned chicken breast and pulled bbq chicken to veggie egg scrambles and this yummy okra succotash. This pan literally sits on our stovetop during the week because we use it so often. I’ve always needed a pan that has enough room for sautéing and to cook everything in one pan! If you want to cook simple shredded chicken really quick– you need this pan. Just pop the lid on and it cooks up so fast. Why have a slow cooker when you have a fast cooker that makes chicken so juicy!? And hello skillet dinners, I’m loving you right now. Get ready guys…. the skillet dinner is one that I’m becoming really good friends with thanks to the All Clad 5d Stainless Steel All in One Pan. Okay and if you are as excited as I am about cooking ALL-IN-ONE pan…. 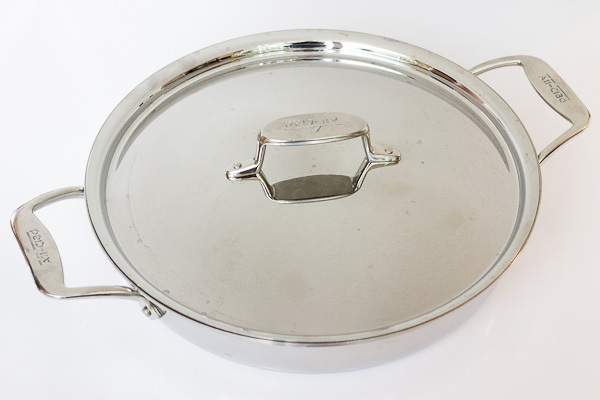 All Clad has offered to give away one All-Clad 5d Stainless Steel All-In-One Pan (4 Qt.) which retails ($149.95) to a lucky reader!! I’m hosting this giveaway on Instagram so enter to win by tagging one of your friends in the comments. 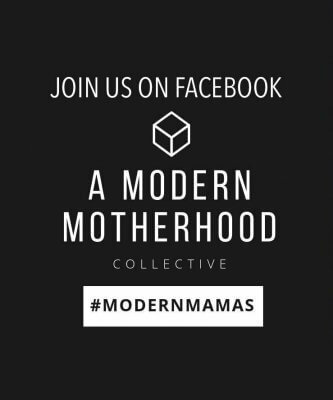 Enter as many times as you want… giveaway ends June 2nd at 12PM EST. The Stainless-Steel All-In-One Pan is available at Williams Sonoma. For more information, please visit Williams-Sonoma’s website or allclad.com. 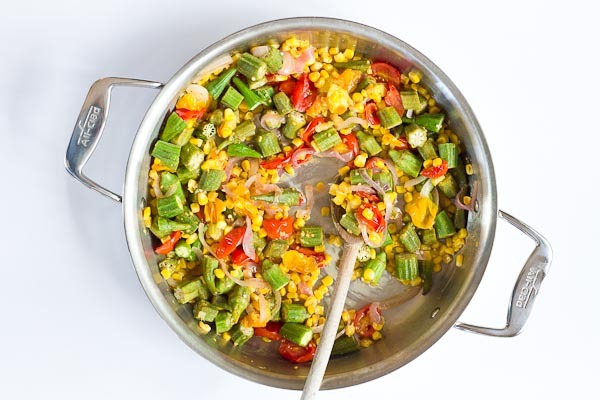 Add onion, tomatoes, corn and okra and cook covered until tomatoes blister, about 12 minutes. Stirring occasionally. Add salt and pepper to taste and herbs like rosemary or oregano, if desired. 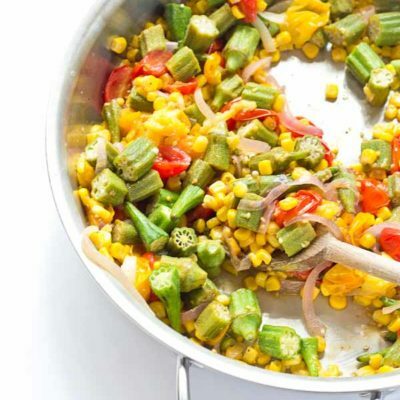 So this looks delicious, but every time I’ve cooked okra in the past, it releases a whole load of slime – does this happen when sauteeing (a method I don’t think I’ve tried yet with okra), and if so, how can the slime be avoided? 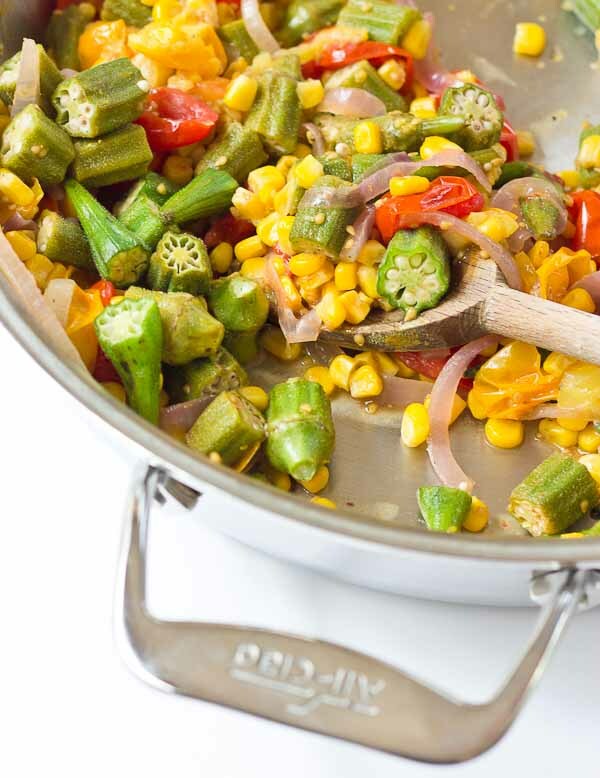 I’d try to roast it~ baked/roasted okra is my favorite way to eat it okra. It really dries it out.